I loved going to school on the weekends. Just couldn’t wait for the weekends to come. You see, I grew up in the school yard. Living right next door to P.S. 42 in Arverne was idyllic for a young child such as I. Our house was next door to the south school yard (or the “girl’s school yard back in the day). It was my own private back yard during the weekends. I learned how to ride my bicycle there. There were stenciled games on the asphalt, such as “hop scotch” or “dead box” (also known as “skully” or “skelly” back then). There were large circles stenciled on the ground, rudiments of the annual “May Day” festivities my older siblings participated in, ending just a few years before I entered elementary school. Those circles were great to follow on roller skates or with your bicycle. You could do figure 8’s when going really fast. Our bikes came from Rockaway’s own Chain Bike Company. They made Ross bicycles, which are collector’s items now. They were better than any store-bought bicycle. 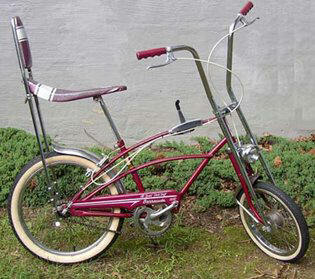 We even had a “Barracuda” bicycle in the family. It was really sporty. Stickball was the game of the day for the boys. The girls could watch, but not play. Stickball was played on the side near the B. 65th Street entrance, near the custodians’ doors. The boys who were waiting their chance to play would hop up and sit on the ledges that were part of the old coal chutes, permanently closed at some point in the 1960’s. Chalked on the wall was the strike zone. After each hit, the pitcher would check the ball or the strike zone to see if any chalk was on the ball or missing from the wall. Those precious balls were pensie pinkies or spauldings. I liked the pensie pinkies the best, as they were soft and rubbery to the touch. Our family collected quite a bit of them: enough to sell to kids (if we wanted to) who didn’t have any of their own if they showed up at the school yard without one. After all, those stickball sluggers would occasionally hit the balls over the high fence and onto the roof of our home, where they collected in the gully between the attached houses. The door bell at our home would ring from time to time by honest kids looking to retrieve their rubberized treasures. Others would not even ask for permission before hopping onto our roof. At least twice a year, my father would send one of my older siblings on top of the roof to collect those balls that weren’t claimed. Yes, we had a few windows broken by balls too. Those culprits didn’t ring our bell – they took off instead! Local players sported interesting nicknames, such as “Eggy” (my brother Craig), Bagel, Koufos, Doobie, Googie and Alley Cat. For some reason, the pitcher was constant – he didn’t change no matter which side was up. I didn’t know the intricacies of the game since girls didn’t play, but nonetheless, it was interesting to watch. Punchball was my game. Though I wasn’t good at it, I enjoyed playing. That was the girls’ game. We used the bases already stenciled onto the ground for baseball or softball. Again, my never-ending fascination with pensie pinkies. Buying the rubber balls was as easy as going to the corner stores. We had a choice of Mary and Larry’s Candy Store, on Beach Channel Drive near Beach 66th Street, who carried limited amounts and varieties of balls, or Bernie’s, a much larger store, located only a few stores away from Mary and Larry’s. Operating like Mary and Larry’s lunch counter, Bernie’s had much more room, so much more variety of items were stocked. Being the wonderful people they were, if Mary and Larry’s didn’t have it, they would tell you whether Bernie’s carried it or not. Bernie’s store was where we went “back to school” shopping for school supplies. I bought my first record, a 45 RPM, titled Devil With The Blue Dress for 25 cents from Bernie’s. They carried everything from jump ropes to greeting cards. I liked the food better at Mary and Larry’s lunch counter, but everyone said the fries were better at Bernie’s. Looking back, I just couldn’t understand why people would eat at the counter but still have their fries placed in paper bags (sometimes double bagged) and then cover them with mustard. Years later, I figured it out. Getting back to the school yard, it was an oasis in the winter. We used to sled down the hill on the ramp leading into the school yard. If it rained and then iced up, the entire school yard became an ice skating rink. Though some kids tried riding their bikes on the ice, I had ice skates. If it was really bad, I could skate from the fence of my side yard to the inside of the school yard. Few kids had ice skates back then. I was very fortunate to have older siblings who outgrew their sports equipment. Snow forts and snowmen would stay many weeks in the school yard, only falling to rain or warmer weather. Go karts and soap box carts in the school yard were fun. Though I wasn’t old enough to drive a go-kart, my brothers were. My father brought home a few of them for my brothers to ride. 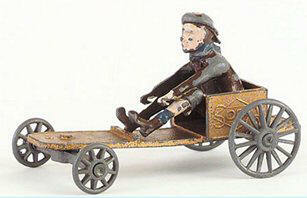 A few of the boys in the neighborhood built their own soap box carts, which were really made from wooden milk crates. The boys took extra clothes line or cut down their mother’s clothes lines and use them to steer the front of the cart. Wheels from baby carriages were used. Mitchell and his brother Phil always made the best carts on the block. When my parents had friends over, they would collectively tell us, lovingly, to “get lost in the school yard” to get out of their hair. My parents would sit on their front porch and chat with others while still having an eye out for us. Safe play was in store for all the children with parents watching from the comfort of their own property. We didn’t have to cross a street or be out of visual range of adult supervision. Chalk was one of the best gifts I ever received. In the school yard, the ground was like a limitless canvas. Unfortunately, that is also where I learned to write curse words. Once a family member found it and tattled on me, only to run home and find a bar of soap waiting for me. I didn’t know what curse words were back then or how to spell them, but I learned quite quickly how to avoid a mouth full of soap. My parents forbade me from playing with “those friends” for a long time. 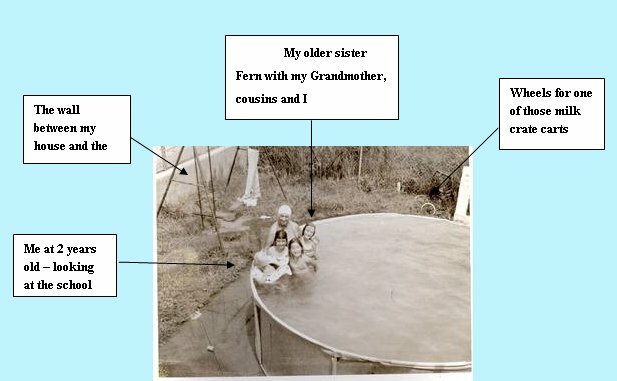 In 1970, our family moved from Arverne. It was emotionally difficult, even at the age of 12 to move away from the school yard. I knew, back then, at a very young age I had something special next door to me. I was a very lucky person with wonderful experiences that are still carried in my heart to this day.